Are you about to travel to Russia to visit Saint-Petersburg? Discover the best districts to stay in Saint-Petersburg. Formerly called Petrograd (1914-1924), then Leningrad (1924-1991), St. Petersburg is the second largest and most populous city (5,281,579 inhabitants) of the Russian Federation after Moscow. Needless to say, accommodation in Saint Petersburg is expensive, so it will be necessary to book your lodgings well in advance. Saint Petersburg is also the second largest city in Europe, boasting an eyeful of colourful architectural feats to enjoy. The capital of the Russian Empire from 1712 to 1917, Saint Petersburg – nicknamed the “Venice of the North” – is listed as a World Heritage Site by UNESCO since 1990. Nestled at the easternmost tip of the Gulf of Finland in the Baltic Sea, the city of Saint Petersburg is huge, though we do recommend you to stay in the historic centre. These are the best areas to stay in Saint Petersburg. The central district houses all the sights and activities of interest and everything is situated within 20 minutes walking distance. This is THE place to stay in Saint Petersburg if you have the required budget, because obviously, like any city centre, rental prices and accommodation rates are at their peak in this area. 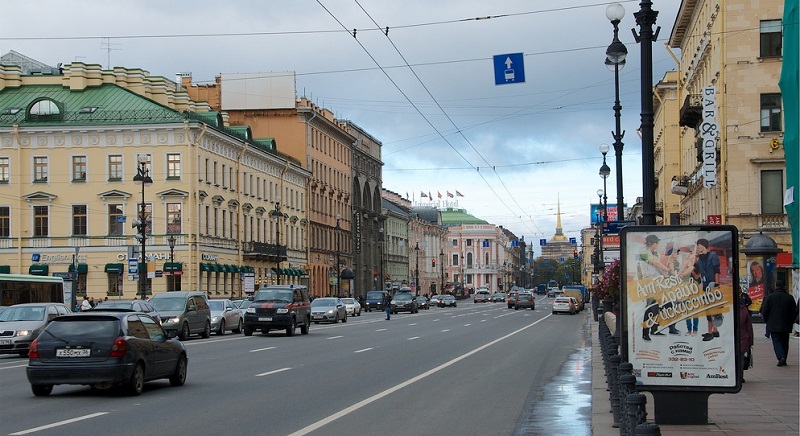 The famous Nevsky Prospect, which runs across both sides of the Neva, is the city’s main street. 4.5 kilometres long, it is very lively and is close to historic monuments such as Palace Square and its obelisk, Stroganov Palace, Winter Palace, etc. The area is home to a wide array of museums and luxury shops, bars, trendy restaurants, and public gardens including Alexander Garden, the Field of Mars, Summer Garden, Mikhailovsky Garden, Tauride Garden. When you arrive on the northern side of the river – Kalinin district – stop by the Finnish railway station, where Lenin arrived and sparked the October 1917 Bolshevik Revolution. It is also one of the city’s most coveted nightlife hotspot: stay in this area if you like festive and shopping-friendly areas. Rubinshteyna Street is one of the city’s most famous streets. 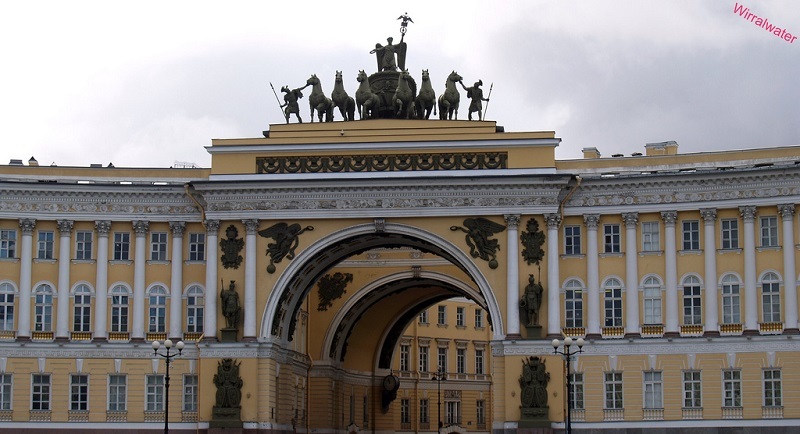 It offers a central position to stay in Saint Petersburg. Numerous restaurants, cafes and bars, or other karaoke line the street, creating a lively atmosphere that can be noisy at nighttime. It’s Saint Petersburg’s party-friendly district. You can easily walk to the Hermitage Museum and the Church of the Savior on Spilled Blood: a great way to enhance your urban walks. To stay in this area, rent a room in a youth hostel, or an apartment on Airbnb as there are few hotels. 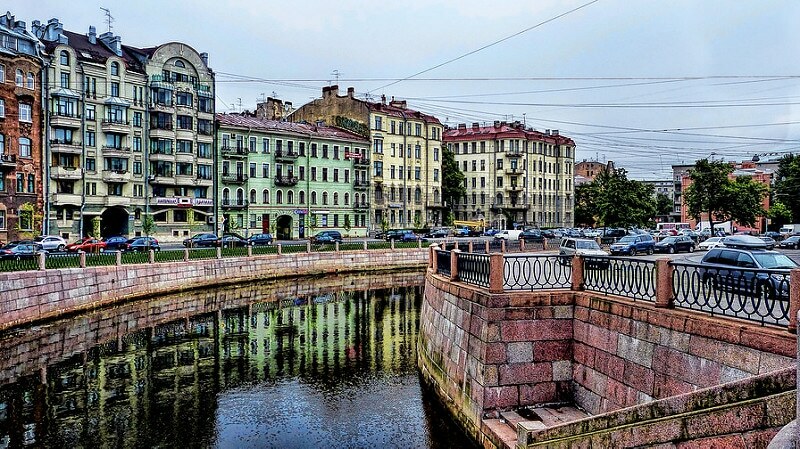 To immerse yourself in the authentic part of Saint Petersburg, discover the quays of Fontanka and the Griboedov canal. Though it is situated further away from the centre, this area is also quieter. Bordered by the Neva River, the district has meandering canals and is home to numerous theatres – Mariinsky Theatre, Young Spectator’s Theatre, Fontanka Theatre, etc. Rich in history and culture, the district is home to several interesting sites to visit, such as the Admiralty Shipyard or the Grand Choral Synagogue. You’ll find many bars, restaurants, shops and shopping malls along Sadovaïa street. Comprising several islands north of the city centre and the Neva delta, Petrogradsky District offers tourist activities for everyone (whether young or old) and will delight History lovers: the Divo Ostrov amusement park, awarded the title of best amusement park in Russia, the Leningrad Zoo, the Peter and Paul Fortress, or the St Petersburg Botanical Garden. It’s a nice place to stay in Saint Petersburg if you’re looking to escape the hustle and bustle of down.